Skilled PHP developers providing custom web applications, eCommerce, and custom php software. PHP is a widely-used scripting language that is especially suited for Web development and can be embedded into HTML. If you are new to Custom PHP development and want to get some help fixing existing code, or need custom php programming or a stand-alone application or contribution, please contact us for any Custom PHP Development needs. There are countless software applications created using PHP development as a basis or framework.The software may not specifically be PHP but the coding is very similar. We work with ALL of these applications including; WordPress, osCommerce, Zen Cart, Drupal, CMSMS, Zend, Smarty, Joomla!, CRE Loaded, Magento, and more! 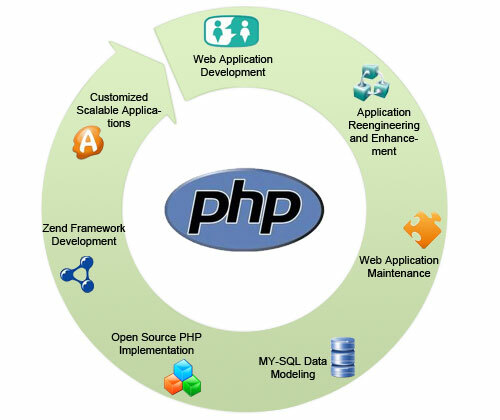 Whatever software you are using, Atwoodz can provide high-level, custom PHP Development and support. If you ever need any assistance in the future you can rest assured that all php programming and design will be done in-house at our facility by english and spanish speaking php developers. We do not outsource to India, or any other country for that matter. HTML5, CSS, jQuery, mySQL and more!